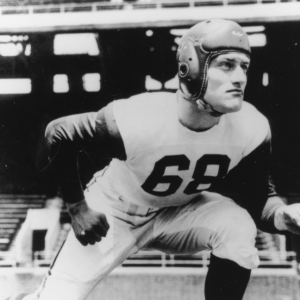 Bernie Lemonick was a first team all-American as a member of the University of Pennsylvania football team where he played in the late 1940s and early 1950S. One of collegiate football’s premier offensive and defensive linemen, he was a participant in the 1950 East-West College All Star Game and a member of the 1951 college all star team that played the Cleveland Browns. That year, he was drafted by the New York Giants. Prior to his college career, he was an all-public guard at Olney High School. Following his graduation with honors from the University of Pennsylvania, he was the line coach at St. Joseph’s Prep. From 1955 to 1959 he was the defensive line coach at Penn. His last season, the Quakers won the Ivy League championship. He is a member of the Pennsylvania Sports Hall of Fame and the University Of Pennsylvania Hall of Fame. He is a 1985 recipient of the distinguished American Award given by the National Football Foundation and Hall of Fame, Philadelphia Chapter. In 1997, he received the All-American Football Foundation’s 45 year All-American award. He also is the recipient of the University of Pennsylvania’s Highest Alumni Award for his service as a member of the Board of Directors of the General Alumni Association and Vice President of the association and the organized classes.